These are the sentiments that were conveyed over and over again by the Gwich’in people and their supporters in regards to opening up their homes to oil and gas drilling. 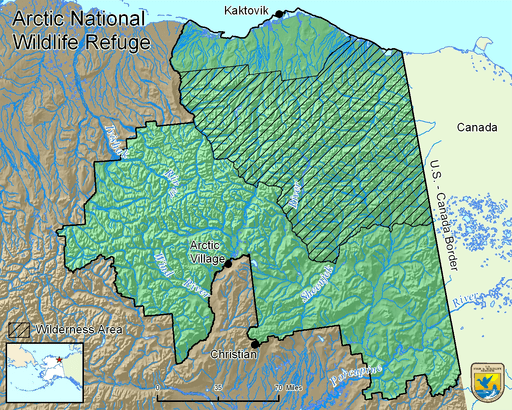 People have always tried to open up the Arctic National Wildlife Refuge (ANWR)to drilling to reach the oil and gas underneath the land and reduce foreign dependence on fossil fuels. However, there has always been backlash given this is very much against the goal of a wildlife refuge. However, with the release of the FY18 budget under the Trump administration, this threat to the refuge has been moving forward and gaining support once again. Despite the unquestionable stance of the president, this decision now lies in the hands of the U.S. Congress. Recently, there have been a series of community meetings in Alaska and even one in Washington D.C. As an intern at the Refuge Association, I went to the this last hearing, the Coastal Plain Oil and Gas Leasing Program Environmental Impact Statement Public Scoping Meeting. This meeting was about the timeline of the environmental impact statement. The process was proposed to be done on a much quicker timeline than past statements. Before attending the hearing, there was a rally that I attended right outside of the meeting. This rally was for protecting the ANWR’s coastal plains from oil drilling. I saw many people at this rally supporting the protection of the refuge including the Gwich’in community, environmental groups and even some fellow Nic schoolers. There were many different speakers talking about the importance of the refuge to the community and ecology. It was great to hear from an expert like Bernadette Demientieff about just how sacred the land is to her people. Watch the clip below to hear the importance of this issue straight from Ms. Demientieff. The Gwich’in people are Native Alaskans and First Nations people of Canada. Part of the Gwich’in community depends on the Arctic Refuge National Wildlife Refuge for all aspects of their lives. An important staple of the Gwich’in diet and culture is the Porcupine Caribou, a caribou species native to the coastal plains of northern Alaska. The caribou is more than just an animal to recognize in the coastal plains of Alaska, it’s a symbol of the people and connects the all Gwich’in generations together according to Bernadette Demientieff, Executive Director of the Gwich’in Steering Committee. ANWR serves a very important role as its lack of development and human disturbance helps significantly in preserving this species. Many were afraid that this could lead to a lower quality statement that overlooks some important environmental impacts that threaten the Gwich’in people and the ecosystem. However, a counter argument that I heard from different people was that this project would bring more economic opportunity to the community. I heard this argument from many different people including the mayor of a neighboring town, a member of another native Alaskan group, and people from the oil and gas industry. Despite the variety of people who spoke for the drilling of the refuge, my biggest takeaway was that this view gave absolutely no space for Gwich’in values. There was a lot of talk about economic development but this not only benefits stakeholders disproportionately, but is something that the Gwich’in don’t value as much as their clean land, air and culture. The Gwich’in feel that they are a part of their land and hurting the land is the same as hurting their way of life. However, what really surprised me was just how precious and sacred the coastal plains are to the Gwich’in. The coastal plains specifically are home to important migratory routes and breeding grounds to the porcupine caribou. This land is so sacred that even the Gwich’in don’t go to the coastal plains in efforts to keep the porcupine caribou safe. I’m glad that I got to spend my Friday night at this hearing as it was truly reassuring to hear from people speaking up against this action. I heard all kind of voices at the hearing from large national NGOs to people who travelled all the way from Alaska. And even though so many people spoke at the hearing, there were many people who wanted to and didn’t get the chance. There were also many more people who provided public comments online as well. If you feel strongly about this issue, please consider learning more at the Gwich’in Steering Comittee’s website and consider taking action. You can also take action through the National Wildlife Refuge Association.